Welcome to 2nd Base on the shores of Lake Michigan, one of the grandest of the five Great Lakes. Nestled in Sawyer, MI in the exclusive and private community of Shorewood Hills, is this spacious and unique property consisting of a Main House and a Guest House. You will fall in love with the private beach, the sound of crashing waves, the spectacular sunsets, the stunning views of Lake Michigan, and 2nd Base of course! All of this provides a perfect venue for a relaxing holiday that will bring you back to nature. Best yet, it is only a one and a half hour drive from Chicago. The three story main house has 6 bedrooms and 5 bathrooms accompanied with multiple living areas overlooking Lake Michigan. The entire home is bathed in natural light. Guests will enjoy the expansive lake views and light through the floor to ceiling windows and skylights throughout the house. The open concept main floor has a large kitchen featuring an island with a electric cook top, two sinks, a dishwasher, garbage compactor, and a buffet area. There is a lovely dining area attached to the spacious kitchen with a large custom made maple round table that seats 12-14 guests. A comfortable living area with a sectional sofa, a mounted flat screen TV and a maple table for four completes the living area. From this space, guests have access to a terrace complete with comfortable patio furniture and a gas grill. 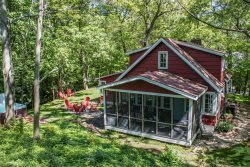 It's an ideal location for barbecuing and watching the stunning Lake Michigan sunsets. Two bedrooms, one with a queen bed and one with two twin beds, and a full bath with a shower/bathtub are found on this level as well. On the second level, guests step into another spacious living area with floor to ceiling windows offering beautiful lake views, ample comfortable seating around the flat screen TV, and a newly installed gas fireplace. Another large terrace beckons you to enjoy the colorful sunsets, the majestic rising moon, and often the lights of Chicago across the lake. Two bedrooms are housed on this level. Both bedrooms are furnished with queen beds and have en suite bathrooms with showers/bathtubs. The lower level has a nice living area with floor to ceiling windows. A large private master suite offers a sitting area, a spacious bedroom with a king size bed, built in maple closets, and an en suite bathroom with double sinks and a shower/bathtub. A second bedroom with a queen bed, a bathroom with a shower, and the laundry room complete this level. The guest house is perfect for children or adults who are still young at heart. This fun red, white, and blue haven has a kitchen and a small eating area, There are two bedrooms with two sets of bunk beds each, a bathroom with a shower, a TV, and a second washer and dryer. A large terrace, complete with gas grill, patio furniture, a hot tub, a half bath, and two outdoor showers, separate the Main House from the Guest House. If relaxing on the beach and splashing in the waves is what you enjoy, a 100 foot boardwalk through the dune grass leads you to our beach. If you need a respite from the beach, there are many interesting activities in Harbor Country to discover: kayaking, surfing, blueberry picking, Sawyer’s beautiful art and sculpture museum, breweries, wineries, farmers’ markets, ice cream parlor, antiquing, shopping, and many great restaurants. Treat yourself and come experience “the Riviera of the Midwest”!